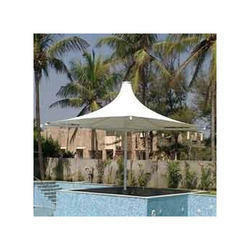 We are the leading manufacturer, wholesaler and exporter of Tensile Umbrella Structures to our valuable clients. We have placed a distinct position in the industry by endlessly manufacturing and supplying a qualitative array of Tensile Umbrella Structures. These are designed precisely by our experienced professionals, who keep in mind the upcoming preference of clients in mind. Furthermore, we customize our range according to the given details and specifications of clients.